Home > Mysa Minutes > Introducing: Energy Charting! It’s here! One of the hallmark features that we’ve been working towards since we first thought of Mysa is finally rolling out. 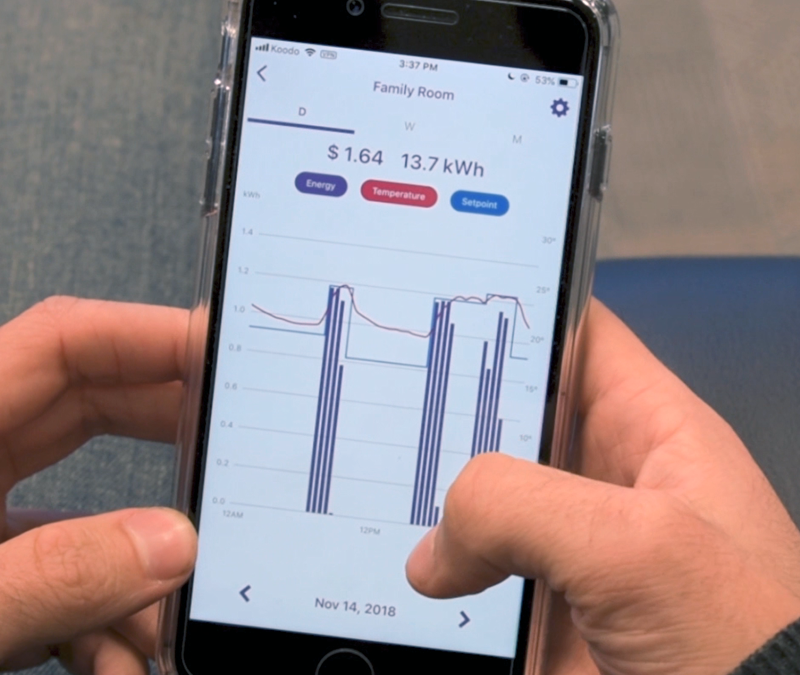 Being able to watch, chart, and track your energy use was one of the main things we wanted to implement once the ball was rolling, and we’re glad to roll out a version that will help thousands of customers save energy. With thousands of Mysas now online, we finally have the data to help you save even more energy. But how does it work? How can we actually keep track of energy that you use? Mysa is built in-line with the electricity that’s being used. Unlike low voltage counterparts, it precisely measures the current that’s flowing through it, how much of it is being used, and converts the readings for Voltages and Amps into a more common unit of measurement: Kilowatt Hours (kWh). 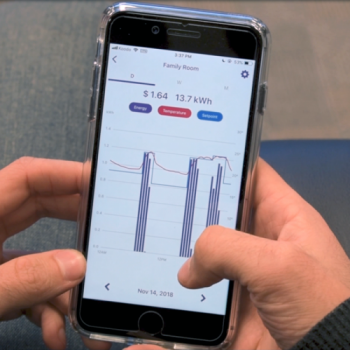 For anybody reading their electricity bills, you’ll notice this is how utilities measure energy use – so, with Mysa, you can see the difference right on your bill. First things first, you’ll need to enter your electricity rate into the app. if you have a fixed rate for your electricity use per kWh, it’s simple – just take that number from your bill and put it right into the “Electricity Rate” section. Our charting tool will then show you exactly how much energy you are using to heat your house. If your electricity provider uses variable or tiered rates, it’s impossible for us to match peak use charges and exactly replicate your electricity supplier’s calculations. What we suggest is either using the off-peak rate, as that will make up the majority of your energy use, or using an average rate. In either case, we will still show you exact usage and a rough count of how much you’ve spent, be aware that your spend won’t be perfectly accurate – more of an estimate. After you’ve set everything up by filling in the Electricity Rate, the Mysa app will automatically generate usage data that has been collected since you first hooked up your Mysa. That’s right – even though we’re just launching the energy charting feature now, all the electricity that your Mysa has used has been logged in the cloud. Go back through the days, weeks, and months since you first installed it and see how much you’ve saved and learn how you can make more improvements! Reading the chart is easy. The number of kWh used shows up in purple bars, the reading from the temperature sensors show up as a red line, and the setpoint of the thermostat is a light blue one. It’ll update the following day. You can also keep track of energy use in the Zones you’ve created with your Mysa! Remember that electric heat consumes anywhere from 40 to 60% of an electricity bill, so comparing and contrasting with the total usage is going to be different for every customer. We want everyone to be more aware of their energy use and to find ways to cut back. This is just one more milestone on that adventure. First, the build of the thermostat itself is very advanced. It uses PID control to lessen the amount of wasted energy and heat your rooms much more accurately. Secondly, remote control and the associated smart features like zoning, easy scheduling, and geolocation help cut down bills through ease of use, precision, and avoiding things like leaving the heat on by accident. Only heating when you need to heat is the goal, right? Third, we’ve included eco-mode, which makes sure that your room stays warm while saving energy. This ensures comfort and savings. So, we’re saving energy in a lot of different ways. It’s up to you to do your part and help us make the world a greener place. Can you roll out a feature to see a complete overview of energy usage in the home? I don’t want to define zones, because none of them make sense as a group. It will definitely be coming in a future update. This is just the first version of our charting feature. Have been excited to see this feature for a long time. I can really see the difference in rooms with old vs new windows and more wind exposure as I expected. Great tool to have! I hope going forward that the functionality of the feature can be improved to have all of the charting accesible from one place for all rooms without having to have them all in the same zone. Unless I’m missing something, I have to go into each thermostat from the main menu, and back all the way out to get to the next room, having to reset the parameters for the chart (ex. Month, day, or week) each time. Yes, this is just the first version of the feature. We will be making continual improvements over the coming months. Since one week, im not able to see my consommation, is it normal?? Not sure if it’s in the roadmap. For the reporting, would it be possible to add outdoor temperature as well in intervals. This way i can see eneegy used / money spent in proportion to other warmer/colder days. This is a good idea that we’ve certainly brought up before. Right now, we’ve got a lot of things that we’re considering for the future so keep an eye out. We’re aware of the problem and will have a fix soon. It’s a software issue, no problem with your hardware! Just installed 3 Mysas in my home, and absolutely love your product! Very well-built and well-designed. Just curious why you can’t see the chart update in real time, and only the next day? That’s something that will be fixed soon. We had to delay the real-time tracking because it was way too data-intensive, but it’ll be back real soon.